Bowling games for your Windows Phone can be a great way to pass the time. AE Bowling 3D is a relatively new bowling game for our Windows Phone that has promise. AE Bowling 3D has two game modes and the option to play solo games, games against the computer and multi-player games (pass and play style). Graphics are nice, you're not bogged down with a lot of transition screens, and you have the ability to control the angle of your throw with your Windows Phone tilt sensors. The physics could be better but all in all, AE Bowling 3D isn't too shabby of a game. The main menu for AE Bowling 3D has options for a single player, multi-player and you vs. the computer games along with access to settings, the online leaderboard and a help section across the bottom of the screen. Settings for AE Bowling 3D cover sounds on/off and tilt/screen sensativity. The two game modes includes the traditional game of 10-pin bowling and a challenge mode. The traditional game is your typical bowling game of ten frame with strikes and spares. The challenge mode sets you up with a wide variety of pin placements that you have to pick up. Much like you would in a regular game on your second ball. 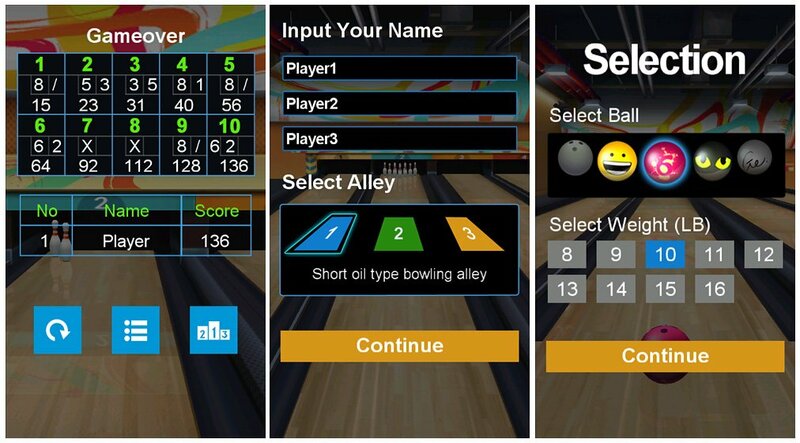 Prior to each game you can enter your player name (for the leaderboard) and choose the lane type. You have one short oil lane and two medium oil lanes to choose from. Game play in either mode is fairly simple. 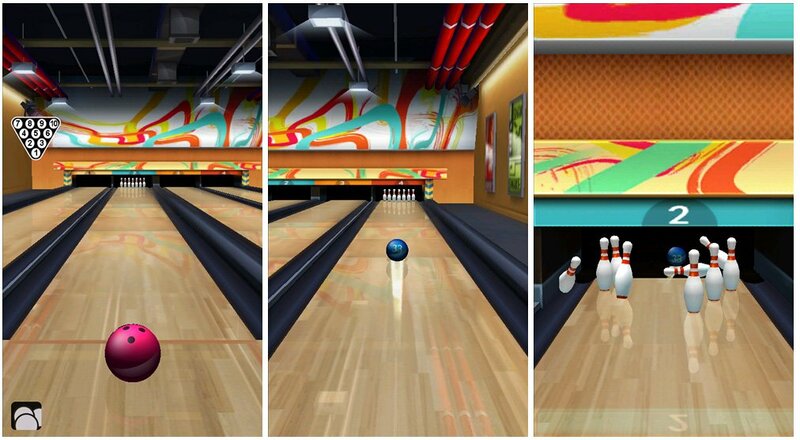 You can tap to move your bowling ball into position and then slide your finger up the screen to begin the roll. If you turn on this feature, as you ball travels down the lane towards the bowling pins you can tilt your Windows Phone to give the roll a hook or curve. In between frames your current score is displayed. To advance to the next frame, tap the "continue" bar. At the bottom of the gaming screen is a bowling ball icon that you can use to change the style and weight of your bowling ball. Overall, AE Bowling 3D is a nice bowling game for your Windows Phone. Graphics and animations are nice, the ability control a hook or curve on your rolls is nice, but the physics of the game needs a little fine tuning. In short, there is no pin action. Pin action is where the pins bounce off the bowling ball, sides of the lane and each other. While there is some bounce, there is not enough. There were too many occassions where pins were left standing when they shouldn't have been. Again, AE Bowling 3D is a nice game but has a little ways to go before it can challenge Shuffle Party as the top bowling game in the Store. The good thing about AE Bowling 3D is that it's a free, ad-support game. You can try it out and if it's not your cup of tea you won't be out anything. 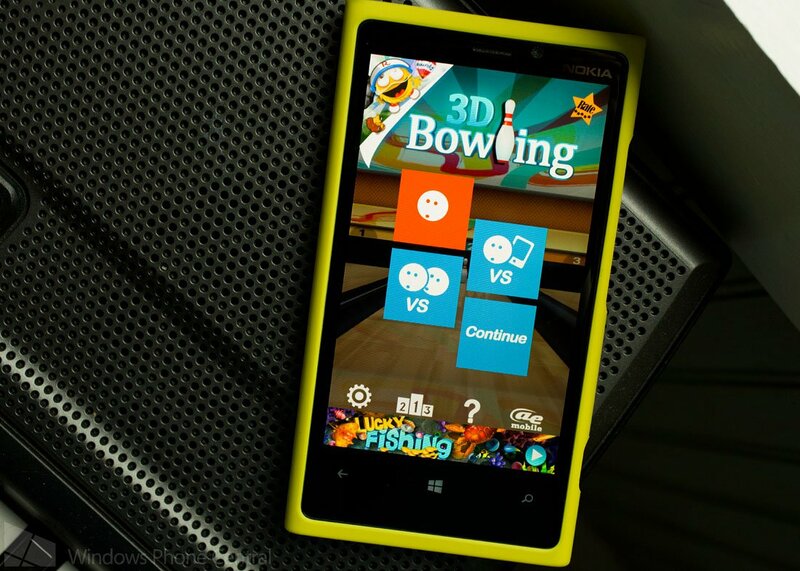 You can find AE Bowling 3D here in the Windows Phone Store. It's available for both Windows Phone 8 and 7.x devices.